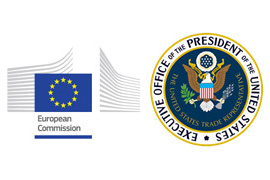 The EU and U.S. EU negotiators met today in Brussels for the first day in a second round of talks to foster progress in the Transatlantic Trade and Investment Partnership (TTIP). The beginning of the week will be devoted to discussions on investment rules and trade in services. The teams of negotiators will continue working on those topics during the course of the week, as other negotiators meet to discuss a range of regulatory issues, including regulatory coherence, technical barriers to trade, and sectoral approaches, as well as energy and raw materials, supplemented by video conferences on sanitary and phytosanitary measures and other topics. Press inquiries should be directed to John Clancy for the European Union and Anne Eisenhower for the Office of the United States Trade Representative. More information about the negotiations can be found on the European Commission Trade website.